The author, Lyubomir A. Zdravkov, is structural engineer with emphasized interest in steel structures. He has participated in many projects for civil and industrial buildings in Bulgaria and around the world. 1. In 2003 year is finished design of 10 tanks with 33 000 m3 capacity each one for Banias Refinery, Syria. These tanks are with single bottom and shell. - 2 tanks are with supported cone roof. Diameter of the tanks D = 50,25 m and height of shell H = 17,28 m. Steel A573 Gr.70 is used for the shell and steel A36 - for central bottom, roof structure and cover plates. 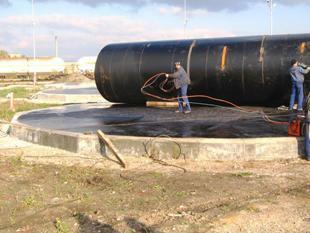 All tanks are designed, prefabricated and erected according to API Std. 650. 2. 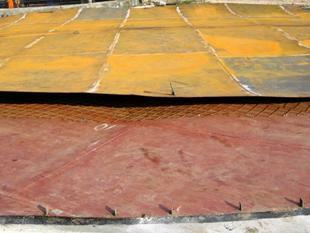 In 2005 year is finished design of 38 aboveground steel tanks in Al-Jabalayn and Palogue, Sudan. These tanks are with single bottom and shell. - 31 smaller tanks with fixed roofs. The bottoms, shells and roofs are made from steel A36. All of these tanks have been erected on earth type foundations. 3. The author has participated of design of group of 8 aboveground steel tanks for light oils with double shell and double bottoms for Kostinbrod, Bulgaria. Capacities V, diameters D and heights H of the tanks are different. They are designed according to standard EN 14015:2004 but shell and bottom are mounted by roll method. Roofs are cone supported, with one central column. For more security all vertical joints of shells and catching basins are transposed on 600 mm. All tanks have active vacuum system for leak detection and prevention of pollution of the environment. Responsible elements like shell, bottom and structure are made from steel ВСт3пс5 (S235 J0). - in the shell are mounted two manholes, which provide access into the tanks. Standard for design of facilities - EN 14015:2004. All tanks have active vacuum system for leak detection that watching for punches on steel bottoms.